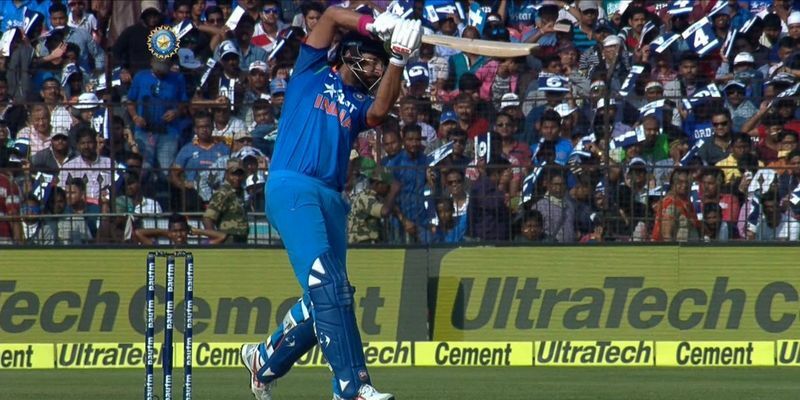 Yuvraj Singh and MS Dhoni rescued India after a poor start with a 256-run partnership for the fourth wicket and helped the hosts to a mammoth total of 381 runs in the second ODI at Cuttack. Despite a couple of cracking knocks from Jason Roy and Eoin Morgan, England fell short by 15 runs in the end. England won the toss this time, and they decided to chase. An understandable decision considering how ineffective their bowling looked in the last match. India made one change to their lineup from the first match at Pune with Umesh Yadav being replaced by Bhuvneshwar Kumar. England, on the other hand, dropped their spinner Adil Rashid and replaced him with right-arm fast bowler Liam Plunkett. KL Rahul crunched the first ball of the innings through the covers, and it seemed like we were in for a repeat of the massacre the England bowlers faced in Pune. However, a tinge of green on the surface allowed Chris Woakes to extract a bit of seam movement and all of a sudden, Cuttack seemed like Edgbaston. Rahul departed in the 3rd over after edging an away-seaming delivery to Ben Stokes at second slip. Virat Kohli arrived at the crease and he caressed the ball straight down the ground, twice in three deliveries, and life was back to normal. But, in a day of upsets which started with the exit of Novak Djokovic from the Australian Open at the hands of probably the only tennis player Uzbekistan has produced, Kohli misjudged the length of a full delivery and edged it to the slips and ended with a single-digit score in the first innings after 10 months. Dhawan, who can now boast of staying at the crease longer than Kohli, followed soon after as he dragged another delivery onto his stumps. India found themselves in what was perhaps the most uncomfortable position in this whole tour at 25/3 when Yuvraj Singh and MS Dhoni paired up in the middle in the fifth over. "It will be like the old days playing with him (Dhoni) when we had started,” Yuvraj had said earlier this month. Of course, he was going to act on it as well, much to England’s peril. A few things were unlike how it was in the past, though. Dhoni’s flowing mane has been replaced by short greys. By the end of the innings, his 35-year-old thumb nearly gave away after being used a bit too much for hitting sixes, and a physio had to be called on to the pitch. Yuvraj, on the other hand, had a bit more ‘presence’ at the wicket. There were a very few quick singles – even if Dhoni could, Yuvi could not. However, for the most of it, it seemed like a Youtube tribute video to these two veterans. Yuvraj was elegant and graceful in his drives. Yuvraj hit a six on the front foot, down the ground, and then held his pose for a while - as if he had to pose for that picture at the top of this article. England came into this game with the game plan of bouncing him out, but neither were they short enough, nor quick enough, to trouble the southpaw. But, they were stubborn enough to keep bowling short at him. Dhoni, at the other end, was a bit more skeptical about taking a gung-ho approach. However, by the time he was done, a spider-cam was in pieces, few of the balls went missing, and India were on their way to a mammoth total. Dhoni and Yuvraj put on a partnership of 256 runs – the highest for the fourth wicket against England in the ODIs. Yuvraj nicked one to the keeper in the 43rd over after scoring 150, while Dhoni was caught in the deep while trying to muscle a full toss over the deep square leg. England, finally, managed to get a bouncer right in the match, but it arrived in the final delivery of the innings, and India had already posted 381 runs on the board. The experts said that England were 30 runs short in the first ODI, so in the 2nd ODI they were trusted with the task of finding those runs. Despite the early departure of Alex Hales, they did get off to a better start than India. Virat Kohli had thrown the new ball to Jasprit Bumrah in this match and held back Hardik Pandya. Both Bumrah and Bhuvneshwar Kumar did manage to extract some early swing and seam movements under the lights, but apart from the one delivery which dismissed Hales, the English batsmen looked fairly comfortable at the crease. In fact, they peppered the off-side boundary with drives and cuts, and the Barabati stadium began to lose its voice. Both Root and Roy brought up their half-centuries and, eventually, the 100-run partnership in the 20th over. At 128/1, the target did not seem unachievable, especially, with the heavy dew predicted to make the lives of Ravichandran Ashwin and Ravindra Jadeja miserable. Pankaj Patnaik, the chief pitch curator at the Barabati Stadium, had warned about heavy dew affecting the match in the build up. With India relying heavily on their spinners, bowling second seemed like a daunting task. However, Ashwin and Jadeja made an immediate impact on the game as soon as Kohli threw the ball towards them. Ashwin broke the century stand between Roy and Root in his very first over. A flighted delivery from the off-spinner did not turn at all, but dipped on Root, who attempted a slog sweep and ended up skying a simple catch to Kohli at the midwicket. Jadeja went through the gate of the bat and the pad of Roy, while Ashwin did the same to Stokes. From 170/2, England were down to 206/5 and were once again staring down the barrel. Eoin Morgan and Moeen Ali kept England in the game with a crafty partnership. The Indian pacers looked as ineffective as the England pacers, and once Jadeja and Ashwin completed their quota of overs, Kohli was left hoping he had another spinner in the team. Add to that, Jadeja dropped a catch of Ali in the 42nd over, and England were left with a target of 100 runs in the last 8 overs. Despite losing partners at the other end, captain Morgan kept fighting a lone battle at the other end making the eventual loss even more heartbreaking for the visitors. The left-hander scored a blistering knock of 102 runs, which contained six fours and five sixes, but was run out in the penultimate over. England finally fell short by 15 runs in the end, but they will take a lot of heart from their batting performance - after all, it would have been the second-highest ODI chase ever.